Have a question for Hotel Venezia? "I will stay in this hotel again." "We really enjoyed our stay here." "Staff were all accommodating and friendly." "Love my attic room which had the Mayon view!" Located in Legazpi, Hotel Venezia is just two minutes from the airport and provides easy access to the downtown attractions. The property can also help cater to meetings or family gatherings from 10 up to 500 guests. For the real adventurous, there is swimming with the whale sharks in the nearby Donsol region. The city also played host to the 2001 Miss Asia Pacific Pageant. 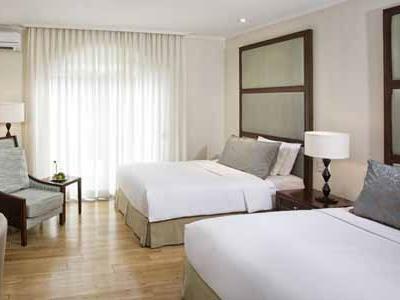 On-site facilities at Hotel Venezia include a room service, a coffee shop, a family room, and meeting rooms. Facilities are also provided for guests with disabilities. Please enter your preferred dates of stay and submit our online booking form to make a reservation at Hotel Venezia. All guests receive a complimentary roundtrip airport transfer. Please specify the details on your reservation. If your idea of the perfect hotel is that it is a remote hotel with no amenities and a very poor layout then this is your perfect hotel. No elevator so senior citizens and their infant child can enjoy lunging their baggage, strollers, etc. up and down the stairs. No privacy curtains in our room so the neighbors that reside 20 feet away can enjoy a free show 24/7. No hotel shuttle so be prepared to take a over priced taxi whenever you want to go off the property. I could elaborate more but it wouldn't achieve a change in this facility. So I will leave it at this; If I had any enemies, I still wouldn't recommend this hotel to them. Location was not so good. Still far from Mt. Mayon. Looked like cemetery at night since have to go through an old gate with no lights. We went around for 3 times before waze inaisted we go in the gate. Old building.. needs renovation. Room was smelly. Stayed here for 2days. Staff were all accommodating and friendly. Laing and Bicol Express from their resto were yummy. Facility was fine. Buffet breakfast is just okay, not fancy. The biggest dissappointment I had was with their wifi, you cannot connect from the 2nd floor so we all go down to their lobby just to access their wifi. The king size bed (Jr suite) was the most comfortable bed I have experienced, though I have a high-quality mattress myself at home. Great sleeping experience. The suite, with Mayon view,was nice and cozy. A drawback was the poor lighting at the room. Not possible to read at nighttime without the light from your cellphone! You could hear a lot of noise from the hallway, the door has poor or no sound-proofing. The breakfast was mainly fish, dried or fried, every morning. So I had only omelette every morning for five days. The dinner was good with more options and well done. I still recommend this hotel. The staff was very friendly and they have clearly improved since a couple of years ago. 7/11 is within 5 min walking distance and going downtown by tricycle cost you 40 pesos. You've get what you paid for. We really enjoyed our stay here. You've really get what you paid for. We really enjoy our stay here. You won't find a better location than this one! Highly recommended. Standard room is too small for 2 people by any standard. Because of the space on hand the bed size in standard room is not Queen size. Restaurant has a very good food and selection is good. Very quiet at night, no worries about street noise or partying loud neighbors. If i was to stay there again I would ask for 1 bedroom suite for me and a standard room for my pet. The service attitude and proactivity of the staff is outstanding. The hotel is so close to the airport that I walked to it. I could already check in at 9:15 am! Unfortunately, the hotel does not take advantage of its location from which Mt. Mayon can be seen because the restaurant is located exactly on the opposite side and there is no rooftop bar. Most if not all of the rooms do not have Mt. Mayon view either. The pool was supposed to be opened from 7 am to 6 pm, but was closed for cleaning during the day on Sunday. Overall, I would still return with pleasure. I’m a Landscape Photographer, I made a last minute booking for me and a friend. And was surprised at the same time amazed that within the hour of confirmation, a Staff was messaging me about Airport transfer accomodations, even what type of bed do we prefer to have. They are very attentive to the needs of their guests. On day of our accomodation, we arrived hours early from check in, we were just supposed to try if it was possible to check in our room, but again to our surprise they were ready and very accommodating to our needs. The Junior Suit was too spacious for two, definitely worth the money for comfort. The location if you’re going around the City via public transportation is very accessible. A few minutes from the Mall, Daraga Church, and Cagsawa Ruins. To end, I highly recommend this Hotel for one simple reason if not the best. They have the best smelling towels I have ever used in any Hotel I’ve been to! :) will definitely return to this Hotel. Could have been perfect 10. Everything was great, staff were great. Our needs were attended to promptly. Until we checked out early the next day to catch our 6am flight back to Manila, to a different desk officer. So after I settled all our remaining bills using my citibank (all food - room charge was settled upon checkin) signed whatever we agreed on we left. Just maybe after 15 mins while we were at the airport I got a text from citibank that my card was used for an online payment at La Venezia for almost 3,900 pesos and I wondered why I was charged and what was I charged for when I already left. Called the hotel immediately (long distance using my globe phone arrrgghhh) to find out what the charge was about. The front desk lady kept telling me that it was for the room payment from agoda. I said I already settled the room through agoda and paid extra bed rate when I checked In i'm not supposed to pay anything else. Then she kept lying as if it was my first time to use agoda or as If I was stupid. I asked how they were able to do the online payment when I have the card with me, they said it was my saved card info on agoda. Take note : I do not save any card in agoda, and i used a different card when I paid for my booking online. Someone definitely copied my card information and used it to double charge me when I already left. They admitted to making some mistake and voided the transaction but it did not leave a good impression with me. PROS: near airport, Legaspi Convention Center & pasalubong center. Buffet meal provided free. Toiletries provided. Offers tour to Misibis Bay at a reasonable cost on weekdays. Nice & attentive staff. Free airport shuttle service to & from the hotel. CONS: No elevator. Breakfast buffet mostly Filipino selection. Small Room. Shower room narrow. Over all, I will go back if ever I revisit Bicol. 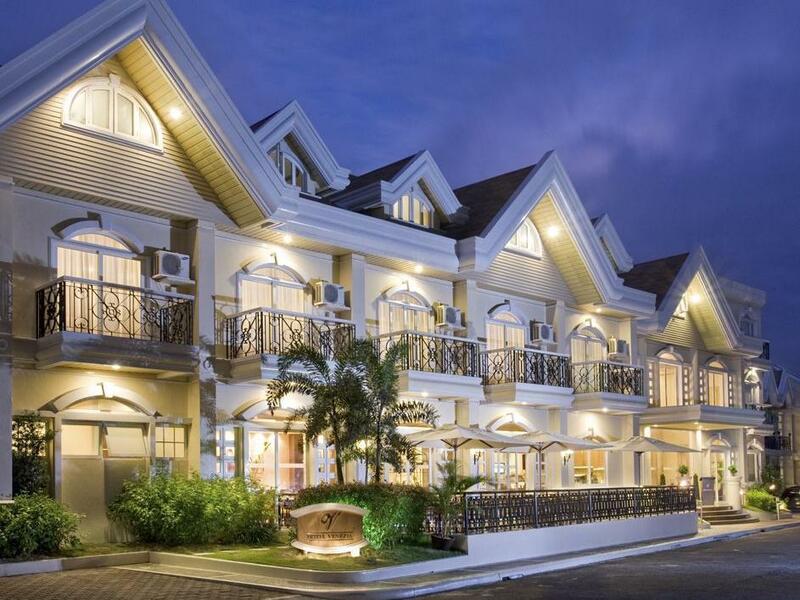 Venezia's location is near the airport & Legazpi Convention Center. Tricycles rate ranges from 16-20 pesos for two although you can walk to the convention center. Ibalong Pasalubong Center is just a tricycle ride too with so many items to choice from. Paid 40 pesos in this route with tricycle. Free breakfast was good with mostly Filipino food. Cereals, bread, butter and jam available but no cheese and cold cuts. Fruits were 4-5 variety. Juice is not fresh, powder only. Brewed coffee available. You can have a filling breakfast, so it's good enough. Booked a standard room for 4 nights for hotel was fully booked. The standard room was small though. Just enough space to go around. No wardrobe, just shelves. Bed is good. Shower area is small. I am slim & petite and yet my elbows always bump the walls when taking a shower. Towels are good with hygiene kit, shampoo, body wash, lotion & soap. One thick shower robe available with 2 pairs of bedroom slippers. Quiet enough on the 2nd floor. No elevator seen. The staff were nice and my request for flat iron was quickly delivered. Did not try the dinner at the restaurant. I found other restaurants more enticing outside the area. There is free hotel transfers which surprised me. Hotel offers day tour to Misibis Bay with discounted rates during the weekdays. Overall, hotel experience and stay was worth the pay. Will re-book if ever I go back to Legazpi. Well this was my fourth hotel tripping around the Phillipines. Basically if your heading to legazpi then put this one on your list. Easily the best hotel I was in. Great staff from the security Man,girls on reception room service etc all brilliant. Rooms are beautiful (I book junior suite) great food (I used room service) no menu in room but call to reception opted that in minutes. It's a little away from the town Centre but a tricycle ride cost 150peso taxi twice that. It's only 5-10 minutes from the mall. Day trips are organized by the hotel at 3500 for the day. It's actually great value compared to paying individually by yourself and a hell of a lot less hassle. Visit lignon Hill for great pics of Mt mayon. Venezia thank you for a great stay I will be back. 5 stars. It was a nice hotel near the airport. Inside an exclusive village. No Mayon Volcano view. We stayed at the Junior suite, it was spacious -- comfy bed, big bathroom but they need to update the shower and the bathroom smelled weird. No Elevator. Breakfast buffet was ok. Very good service. The Venezia is ALMOST Everything I can ask for in a hotel. 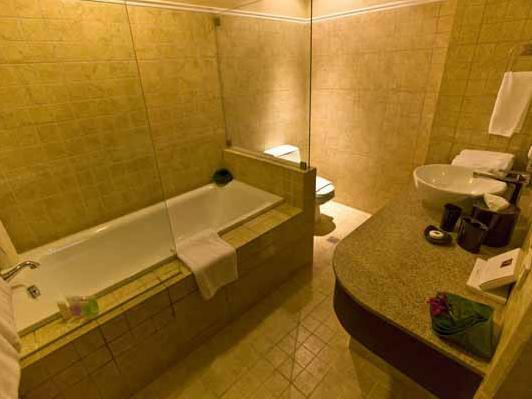 Location is next to airport and at foot of Mayon, rooms are well maintained food is good and staff are professional. It just lacks a gym! That's why I can't give it a full thumbs up... Otherwise it is a good choice for Legazpi City!! I travel often to the Philippines and this is my third stay at Venezia. It rates above any other hotel I have stayed at in the last 10 years. Now that includes Manila and other provences. For example the restaurant food is so good I do not bother eating outside the hotel. Their Squash Soup is something I have never experienced before and it is highly recommended. When it came to organising the tour, the reception had a very good driver who I hired and it was excellent. It is always good to get off the plane and see the hotel shuttle drive waiting, and of course the free return to the airport to catch the departing flight. The building is in excellent condition and a bright colour scheme that highlights the décor. My stay at The Hotel Venezia was ok at best. Upon going I was looking forward to some sightseeing adventures particularly The Mayon Volcano, Caguin Falls and a few other adventures. Unfortunately the weather and exhorbitant costs associated with these excusions precluded my (our) attendance/participation. Please understand the hotel is located in a relatively underdeveloped province in Bicol which although no fault of the establishment still they wanted to charge about $200 a day per activity which is ridiculous.It is far cheaper and more enjoyable to visit other locales within The Philippines so I was not amused. As per my experience the hotel touts free ground transportation between the airport and hotel which was a nice touch and to that end they request detailed travel plans be forwarded to them weeks in advance. I complied with this request only upon arrival to not only not be sent any instructions on meeting the driver but despite looking around there was no sign of my transport. I took a taxi to the hotel which was about 5 minute drive in duration but the not picking me up wasn't even mentioned by the front desk staff until I brought it up. At that point she merely shrugged her shoulders and asked if I saw their hotel van? When I replied in the negative she let it pass and continued with her check in procedures. I was not impressed. The food was average, room was small and all in all a relatively unforgettable experience. Would I return to this hotel which charges Manila rates in a small non-touristy place? Probably not.